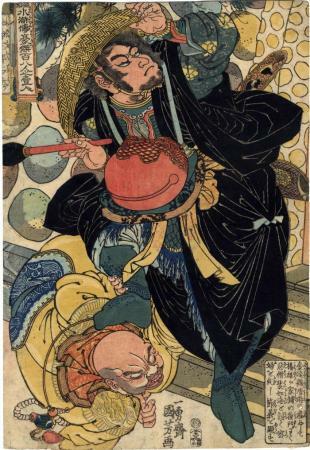 Kuniyoshi portrays Sekishū at the moment he has caught the secret lover of Yōyū's wife. He restrains him with his right foot and carries a drum which belongs to another priest who assisted Haijokai by beating his drum every morning as a signal when it was safe to leave Yōyū's house. Sekishū kills this priest first, dons his clothes and then lay in wait for Haijokai." Quoted from: Of Brigands and Bravery by Inge Klompmakers, p. 94. There is a full-page, color reproduction on p. 95. Also illustrated with a very small color reproduction in Samurai Stars of the Stage and Beautiful Women: Kunisada and Kuniyoshi, Masters of the Color Woodblock Print by Hatje Cantz, Museum Kunstpalast, p. 268, #159.